Miami Dade College has won the prestigious 2019 Lumina Foundation Education Innovation Judges’ Choice Prize, a top national distinction. The prize was awarded to MDC for meeting this year’s innovation challenge focused on identifying, developing and accelerating solutions that help adults in the U.S. develop the skills and obtain credentials that have value in today’s economy. “For some, the decision about whether to stay in school can come down to a choice between putting food on the table or going to class. 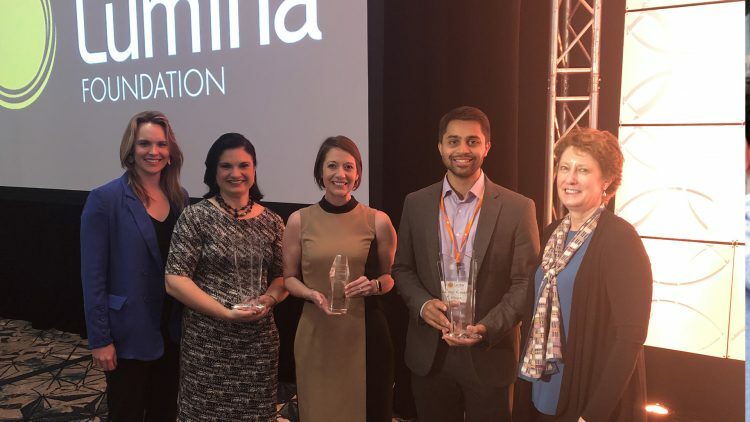 We hope that with our earn-and-learn model, fewer people will to have to make that choice,” said Dr. Lenore Rodicio, Executive Vice President and Provost at MDC who was on hand to receive the Lumina Prize. Lumina’s goal is to increase the proportion of working-age Americans with high quality degrees, certificates, and other credentials to 60 percent by year 2025. Now in its fourth year, the foundation’s Education Innovation Prize is specifically in recognition of MDC ACTS (Accelerated Credentials Training and Skills) and the “earn and learn” program model between MDC and Tesla Corp. Beginning this Fall, over the course of a 12-week period, students will be able to participate in the Tesla START program where they can earn an hourly wage, experience hands-on learning and obtain an MDC stackable credential (Career & Technical Certificate), as well as a Tesla certification to become a Tesla Service Technician. With hourly compensation, a mini-internship, a guaranteed job interview and an offer of employment upon completion, MDC ACTS aims to provide job stability and financial security for our community’s residents as well as a talent pipeline for industry.